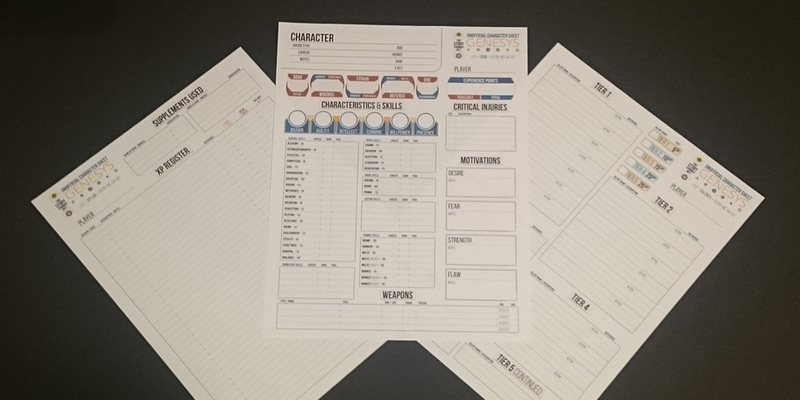 These are the first public version of my new unofficial character sheets for the Genesys Roleplaying Game. I've been using them at my own game table for a few months, and have revised the layout to the point I believe it's ready for a release. 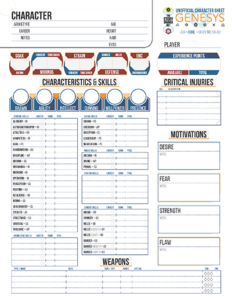 The design very closely mirrors my unofficial Star Wars character sheets, with some notable changes for Genesys. In particular, I wanted more room to write out brief descriptions of talents. 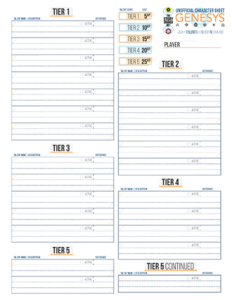 The pyramid visual on the official character sheet is helpful at the very beginning, but isn't needed once you understand how purchasing talents (and tiered prerequisites work). Instead, I went for a design which fits the same number of talents but leaves much more room to write. There's also an Experience Register for tracking how a player earns and spends experience. If you've ever balanced a checkbook, using the page should be obvious. If not... You should probably learn how to balance a checkbook. I really like everything you’ve released so far for both Genesys and SWRPG. Put the abbreviated characteristics (following the name of each skill) in the Skills tables in their own column so they’re aligned vertically. Anyway, that’s not stopping us from using them at our table, so thank you for your tremendous work!